We make planning a successful Columbus meeting easy – and we make it easy for your attendees to enjoy themselves. We’ll help you select perfect meeting venue(s), then assist you with a variety of superb accommodations, delicious dining options and great entertainment, events and attractions. Every step of the way, Visit Columbus is here to help plan and execute your meeting for maximum success! Anchor for the South Commons complex, this versatile facility serves a number of purposes. It has been host to a record-setting crusade conducted by Franklin Graham. It has headlined concerts, including Elton John, Lee Ann Rimes, Chris Stapleton, Bob Dylan, and Reba McEntire. It has filled seats for events as diverse as the Southeastern Conference Women's Basketball Tournament, WCW’s Monday Night Nitro, the Georgia Baptist State Convention and the NAACP Regional Conference. Hospitality Suites totaling 5,000 sq. ft. which can be configured to as little as 1,500 sq. ft.
For more information, Visit the Civic Center Web site. 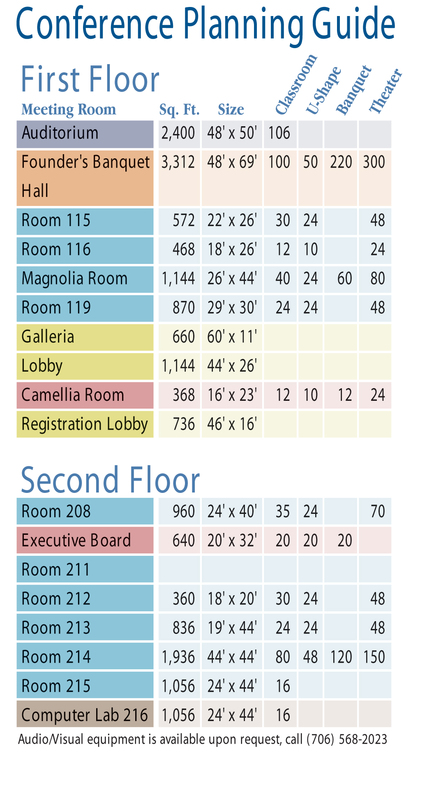 The Columbus Georgia Convention & Trade Center totals over 180,000 square feet of meeting and exhibit space – that includes more than 55,000 square feet of exhibit space in its North, Center, and South halls, a 22,000 square foot ballroom, and 17 breakout rooms for meetings of any size and description. The 200-year old building underwent a major retro-fitting of mechanicals, technology, sound, and other components. For more information, Visit the Convention & Trade Center Web site. 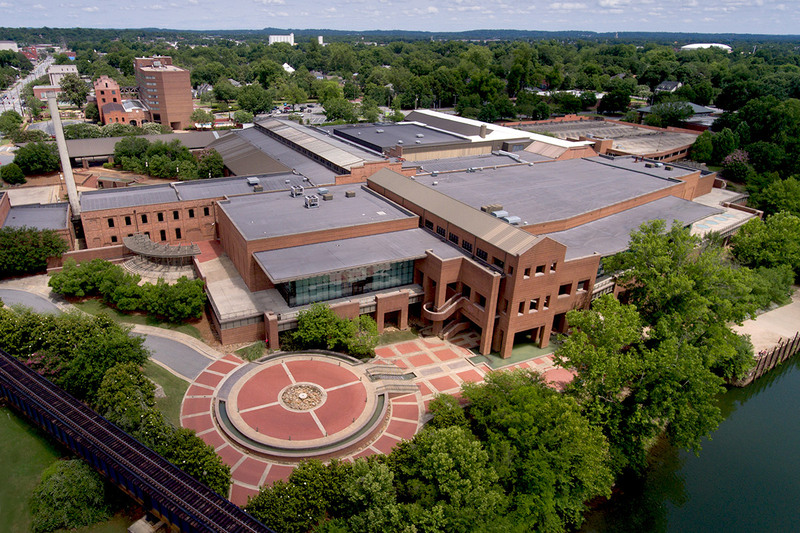 The Cunningham Center Conference Center is a state of the art facility that provides the resources and support to ensure successful meetings and conferences of all sizes. Within the confines of a comfortable and relaxed learning environment, the center features a 5,432 square foot banquet hall, six seminar rooms, an executive board room and four computer training labs. For more information, Visit the Cunningham Center Web site. 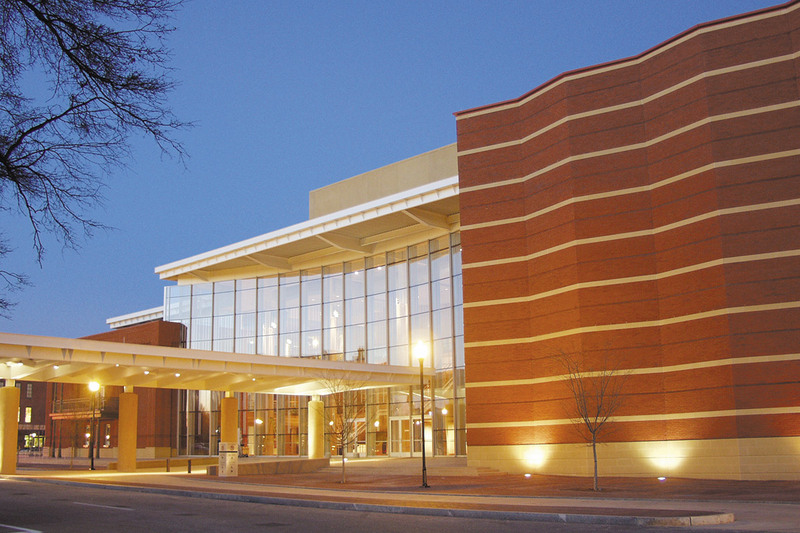 The RiverCenter for the Performing Arts is home to the Columbus Symphony Orchestra, Broadway performances, comedy, musical entertainment, to mention but a few. Three halls allow for a variety of spectator viewings along with a grand public space perfect for receptions and gatherings prior to curtain call. For more information, Visit the RiverCenter Web site. 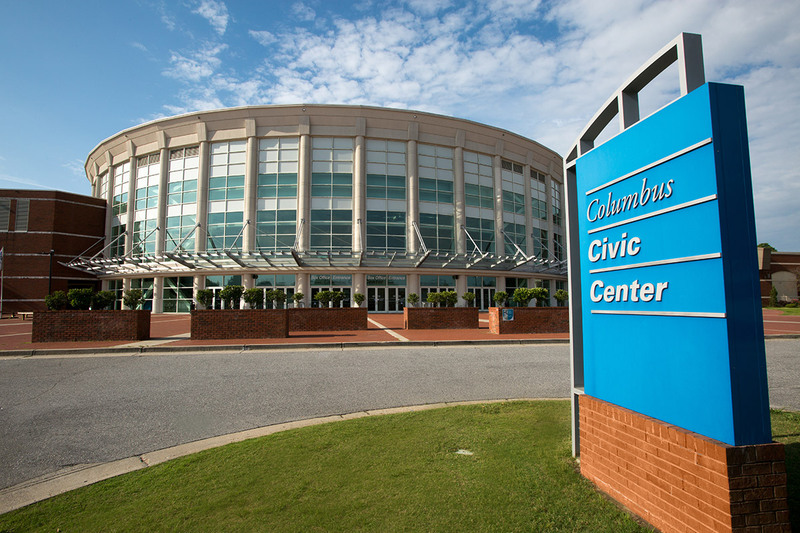 The Elizabeth Bradley Turner Center offers an assortment of adaptable rooms with all of the modern advantages to meet your event needs. Professional, educational, and community-oriented events are all possible in this comfortable setting. 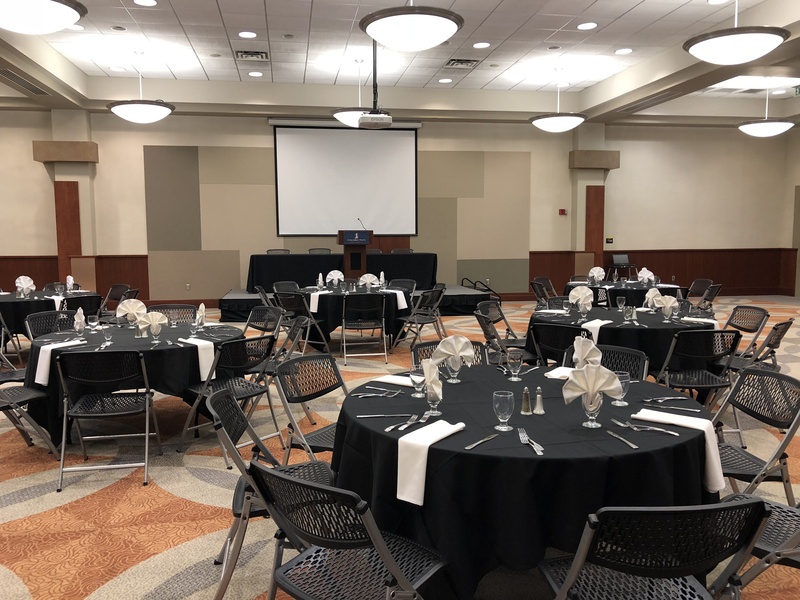 Equipped with up-to-date audio/visual technology, reliable Wi-Fi, and knowledgeable support staff, the Elizabeth Bradley Turner Center provides the resources and support to ensure success for your conference, lecture, class, meeting, or banquet. Dimmable lights, built-in projectors, large viewing screens, and instructor stations are standard in most rooms, with mobile technology stations and wireless microphones available as well. Founders Hall - Ideal for larger events, Founders Hall can accommodate up to 300 guests depending on style of setup. Hold a sumptuous reception or banquet in this space for as many as 200 guests; or seat 300 theatre style for an engaging lecture or rousing religious service. Camellia Room – – The Camellia Room is an ultra-modern conference room that seats 10 guests. Complete with lighting and media centers, this executive boardroom makes an impressive statement. Auditorium – The Auditorium features state-of-the-art sound, lighting and projection systems. The executive-style desk seating for 106 guests offers individual lights and data ports for direct internet access. Executive Conference Room – This large conference room boasts comfortable, executive office chairs for as many as 25 guests. Lighting controls and a media station help make your meeting personalized and professional. Magnolia Room – This large conference room boasts comfortable, executive office chairs for as many as 25 guests. Lighting controls and a media station help make your meeting personalized and professional. Classrooms – Our classrooms range in size and can accommodate various group sizes. The rooms are adaptable in terms of set-up to provide for your specific needs. Catering Amenities--The Elizabeth Bradley Turner Center offers exclusive catering options through our partner, Classic Fare Catering. Whether your event requires a simple breakfast, an upscale executive luncheon, or formal banquet dinner for 200, Classic Fare Catering meets any request with style and creativity. Please visit Classic Fare Catering’s web site to view the most popular menu selections. 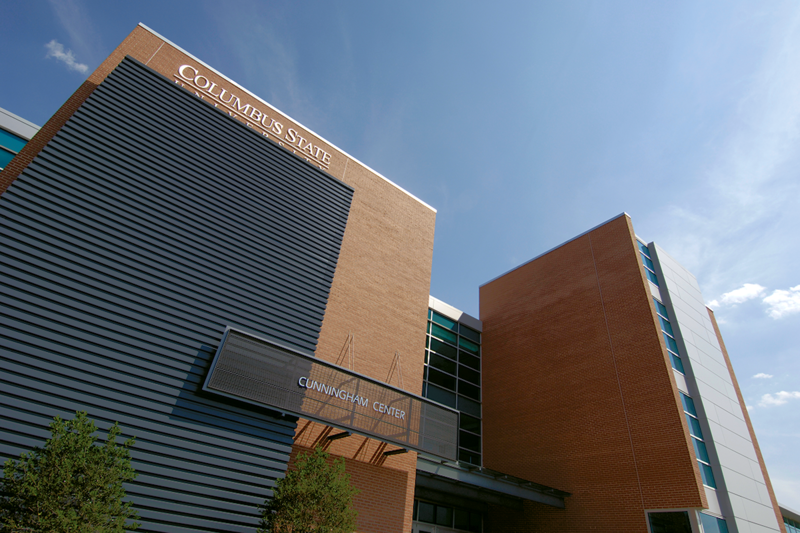 Review Columbus State University’s Alcohol Policy. 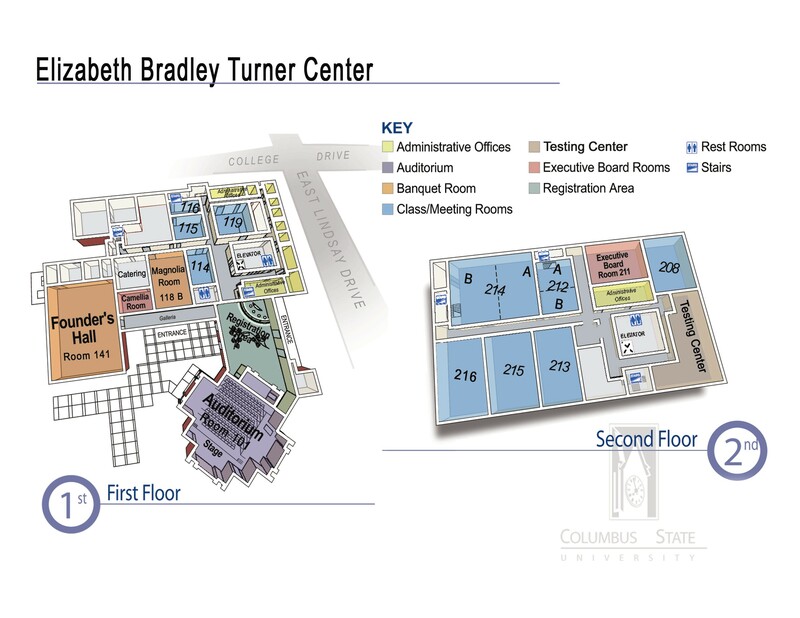 For more information, visit the Elizabeth Bradley Turner Center at Columbus State University website. We are also a full service catering company so our Executive Chef can create the ideal menu for your group. Our services range for small bites to several coursed meals and can be customized to best fit your needs and budget. In addition to our catering services we provide setup and breakdown of your event, free parking, access to valet services and transportation to our local hotels for your guests. We can also help with local hotel group blocks are other local amenities. Tables, Chairs, Floor Length Table Clothes, Silverware and Chinaware. 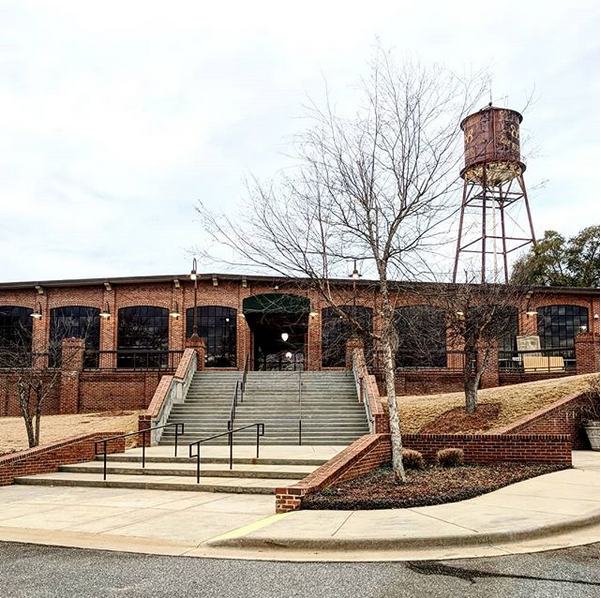 For more information, visit Rivermill Event Center. If you would like to find out more about meetings in Columbus, let us know your needs. Submitting an RFP will enable our Sales Department to assist you with your plans. Access the RFP form by clicking HERE.